By Stella Mapenzauswa HARARE (Reuters) – Zimbabwe’s opposition MDC and ruling ZANU-PF were running neck-and-neck, according to the first election results issued by the Electoral Commission on Monday. The military in Burma (Myanmar) has maintained its stranglehold insensitive to world opinion or the peaceful resistance of Buddhist monks, ..
Zimbabweans are going to the polls today to choose a president, parliament and local councils. The elections come amid a severe economic crisis, as we hear from VOA’s Scott Bobb in our Southern Africa Bureau in Johannesburg. Zimbabweans began lining up outside polling stations before dawn Saturday hoping to cast their ballot early. The elections were seen as a choice between keeping in power the government of President Robert Mugabe, who has ruled since independence 28 years ago, and regime change advocated by two opposition candidates, Morgan Tsvangirai and Simba Makoni. Zimbabwe police Chief Augustine Chihuri warned against any violence before or after the vote. “All the defense and security forces of Zimbabwe are on full alert from now onwards covering the election period and beyond,” said Chihuri. Soldiers and police put on a show of force patrolling the capital, Harare, in a convoy of armored personnel carriers and water cannon trucks. Nearly six million voters are registered to vote at one of more than nine thousand polling stations. They are to choose a president, 210-member national assembly, a newly created senate and local councils. Opposition leaders and pro-democracy groups have expressed concern over what they say are irregularities that could be used to rig the vote. The say they have evidence that voter registration lists have been inflated and that 50 percent more ballot papers have been printed than registered voters. They say the widely feared police are allowed inside polling booths. They also say that the four simultaneous elections, each with its own ballot, will likely confuse many voters because of a lack of voter education programs prior to the vote. However, Mr. Mugabe dismissed these allegations as he voted Saturday saying his government is not in the habit of rigging and his conscience would not allow him to do so. Most Zimbabweans are suffering from an economic crisis characterized by hyper-inflation, 80 percent unemployment and shortages of food, fuel and many basic goods. The winner of the presidential election must receive 51 percent of the votes cast. Otherwise, he must stand against the second-placed candidate in a run-off election within three weeks. New Delhi – Tibetan spiritual leader Dalai Lama on Saturday led an inter-faith prayer meeting in New Delhi in remembrance of Tibetans who lost their lives and were injured during the recent protests in China. GENEVA (Reuters) – The U.N. Human Rights Council unanimously condemned Myanmar on Friday for what it called “systematic violations” of fundamental freedoms six months after the country’s repression of monk-led protests. The 47 member-state body also renewed the mandate of its special investigator to the former Burma for another year and called on the ruling military junta to let him visit to report on conditions there. The European Union presented two resolutions, both adopted by consensus, on behalf of Western countries who said human rights violations had persisted in the wake of Myanmar’s bloody crackdown on pro-democracy demonstrations last September. “There is still reason for great concern,” Slovenia’s ambassador Andrej Logar, on behalf of the EU, told the council on the last day of its four-week session. The independent post of U.N. special rapporteur on Myanmar, first established in 1992, has provided valuable insight into the human rights situation in the insular country, Logar added. Pinheiro, a Brazilian law professor who has held the post since 2000, is being replaced by Argentine expert Tomas Ojea Quintana, who is expected to try to seek a fresh visit. Pinheiro said after a visit there in November that at least 31 people had died and up to 4,000 were arrested in September’s crisis. His latest report to the council cited increasing repression since the crushing of the Buddhist monk-led protests and said that 1,850 political prisoners were still being detained. The EU resolution expressed deep concern at the “violent repression” of the demonstrations and “the failure of the government of Myanmar to investigate and bring to justice the perpetrators of these violations”. 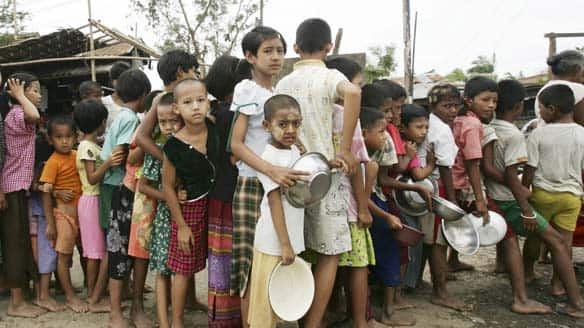 It further condemned “the ongoing systematic violations of human rights and fundamental freedoms of the people of Myanmar, continued arbitrary detentions and the continuing high number of political prisoners”. Britain, China, France and Russia — four of the five permanent Security Council members — are members of the Human Rights Council, while the United States has observer status. Canada, a co-sponsor of the EU texts, voiced deep concern at “continuing reports of human rights violations perpetrated by the Burmese authorities against their own people”. “Many of those arrested remain in detention as does (Nobel laureate) Aung San Suu Kyi. Some have been criminally charged for peaceful expression of their opinions,” Canadian ambassador Marius Grinius said. Myanmar’s ambassador Wunna Maung Win dismissed the Western resolutions as “politically motivated”. “The resolution is lop-sided and highly intrusive, besides it fails to take account of positive aspects of political developments in Myanmar,” he told the council. The government has said it will hold a national referendum on a new constitution in May, with multi-party elections to follow in 2010, to set the nation on a path to democracy. “The international community should therefore recognise and encourage the positive political developments in Myanmar,” the ambassador said.